Rediscover the romance in your relationship with an easy getaway to a romantic inn. 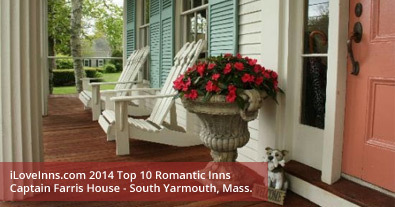 Take a look at the selection of the 2014 Top 10 Romantic Inns. “They are the cream of the crop, offering world-class hospitality, picturesque properties, and amenities and experiences that touch the heart and revive relationships,” says iLoveInns spokeswoman Deborah Sakach. 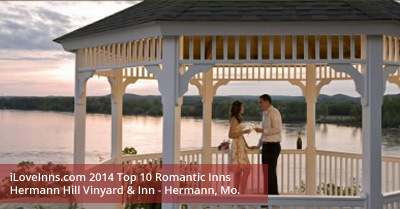 Hermann Hill Vineyard & Inn – Hermann, Mo. Wine Country in Missouri is at its best at Herman Hill’s hilltop location overlooking the Missouri River where bald eagles sometimes fly past the hot tub on your private deck. Every evening warm cookies with ice cream are brought to your room. 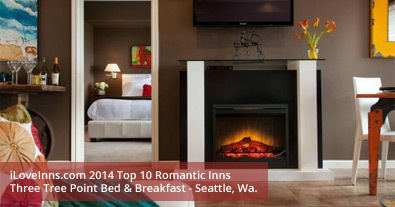 All rooms have fireplaces, steam showers, Jacuzzi tubs. Welcome trays include wine, cheese, bread and fruit. 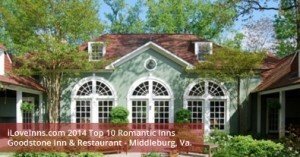 Goodstone Inn & Restaurant – Middleburg, Va.
Goodstone Inn is set on 265 beautiful Virginia acres and offers cottages, farm-to-table dining, hunt country breakfasts, gourmet picnics and canoeing on Goose Creek. A swimming pool is set against the ivy covered historic mansion and a Jacuzzi boasts countryside and garden views. Condé Nast quoted Jenna Bush Hager as saying Middleburg and Goodstone was her second best place (Kennebunkport first). Made INN Vermont – Burlington, Vt.
Hip and mod in the same sentence as Bed and Breakfast? 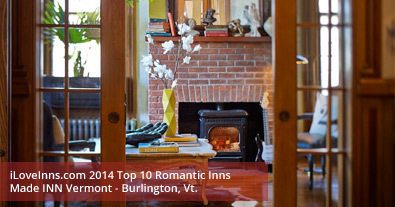 Romantic Made Inn Vermont blends the chic with a setting in a classic Victorian near Church Street Marketplace with its sidewalk cafes, twinkling lights, and live music every day. 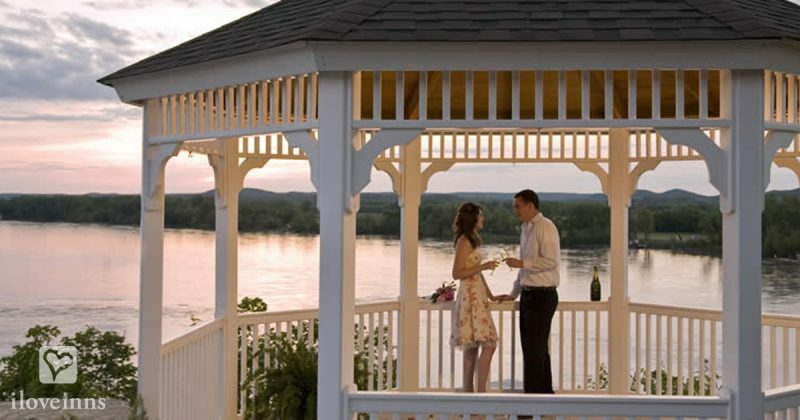 The innkeepers offer warm welcomes, turn down service, and fridges filled with complimentary Vermont products, Vermont beers are offered and there’s a 4th floor belvedere for panoramic views of Lake Champlain and the Adirondacks. Black Dolphin Inn – New Smyrna Beach, Fla.
What makes it sizzle? Hip style on a waterfront sanctuary. Couples take walks along the beach and use the private dock on the Intracoastal Waterway to kayak, canoe, paddle-board with dolphins, manatees, white heron and pelicans. In the inn, an open-air exhibition kitchen makes for a fun foodie experience. innkeepers warm welcomes and attention to guest needs give travelers a profound sense of belonging. 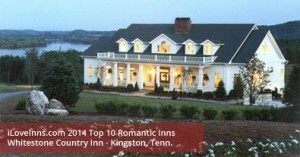 Whitestone Country Inn – Kingston, Tenn. Looking to elope? This inn has its own chapel, florist, gazebo and horse drawn carriage. Couples take walks through the acres of wildlife refuge fronting the lake or through the woods – there’s plenty of outdoor activities. Pristine rooms and cottages offer all the amenities as well as fireplaces and lake views. There’s a unique 8-station marriage walk with reflective questions, a favorite of the many who come for their anniversaries. Maison D’Memoire B&B Cottages – Rayne, La. 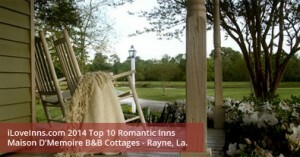 Grab a porch swing and afternoon tea and enjoy your authentic Cajun cottage, then stroll along the pond and stream, through meadows and trees for doing absolutely nothing or jump on a swamp tour and hunt down alligators, take an airboat to skim over lakes and bayous or visit the Flooded Forest of Cypress and Topulo trees draped with Spanish moss, home to 197 different species of birds. Cheshire Cat Inn & Spa – Santa Barbara, Calif. 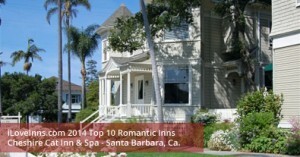 Enjoy the warmth of the Santa Barbara sun and the innkeepers whose motto is hospitality, hospitality, hospitality. They will guide you into enjoying all the town has to offer. Take the train from Los Angeles along with your bikes and you’ll have the time of your life cycling along the boardwalk. Or stroll hand in hand through the streets reminiscent of the Mediterranean with perfect climate and sidewalk cafes and boutiques, then come home to two pristine Victorians for evening treats, a stroll in the garden and a dip in the Jacuzzi. Captain Farris House – South Yarmouth, Mass. 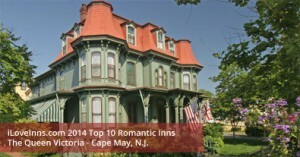 The Queen Victoria – Cape May, N.J.
You won’t believe how much fun you’ll have here – men especially write rave reviews of the 35- room Queen Victoria Inn. Maybe it’s the afternoon teas and fireside chats with other anniversary couples or the ease of strolling along gas-lit streets for dinner, or the beach at sunset. Carriage rides and wine tastings at local wineries are popular. Three Tree Point Bed & Breakfast – Seattle, Wash.
“The best place we’ve ever stayed,” is a frequent comment by those who have enjoyed the beautiful setting on a bluff overlooking Puget Sound, sunrises over Mount Rainer and sunsets over the Olympic Mountains. Some visit Pike Place Market to bring home something wonderful for the barbecue or simply choose Bistro Baffi or 909 restaurant for local cuisine. Love this blog post and iloveinns! Goodstone has a fabulous Romantic Getaway Package right now that includes a four-course dinner for two, chocolate-covered strawberries, Champagne on arrival, late check-out and even breakfast in bed! Check out the rose petals decorating the entry of the Carriage House, too! Wow, we are so excited and honored to be among this iloveinns group! We are looking forward to another year with our Captain Farris House filled with honeymooners and couples celebrating that special anniversary. We are offering some great early spring specials including The Captain’s Sweet Romance Package. Check us out! Love is in the air! Our Romance Escape Package includes two nights accommodations, dinner for two at one of our local restaurants, bouquet of fresh flowers, a chilled bottle of wine anticipating your arrival and of course each morning a delicious full breakfast delivered to your door each morning to enjoy in the privacy of your suite! Come let us pamper you for the perfect romantic escape! We are so pleased at The Queen Victoria to once again be included in this very select group of inns. We are proud to have so many romantic couples make us their home in Cape May every year, be it for their honeymoon, anniversary, Valentines Day, or just a romantic escape from the real world. 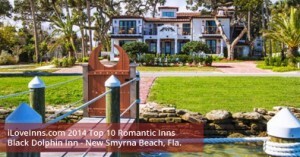 We, at the Black Dolphin Inn, are so pleased to be included in such an elite group of romantic inns receiving the designation as the 2014 Top 10 Most Romantic Inns by iLoveInns.com. Whether you are celebrating an anniversary or just looking for a romantic getaway, the Black Dolphin Inn will provide turn-down service with rose petals, candle-lit bubble bath, chocolate-covered strawberries and a chilled bottle of Vive Cliquot Brut Yellow in the luxury of your room. We will go the extra mile to provide a customized romantic experience for you. Looking forward to offering you a special occasion that you will treasure forever. Given the very long list of hotels and accommodations in the area, it is very helpful that ILoveInns.com recommended these 10 most romantic inns, which are perfect for this year’s Valentine’s day. I love Cheshire Cat Inn & Spa because it has an excellent ambiance, clean facilities and rooms with hot tubs or Jacuzzi. Three Tree Point B&B couldn’t be more charming! The hosts are amazing, the views spectacular, and the area is absolutely delightful. Great to see them on this Top 10 list!